A new 200m zip line has opened for thrill-seekers in County Durham. 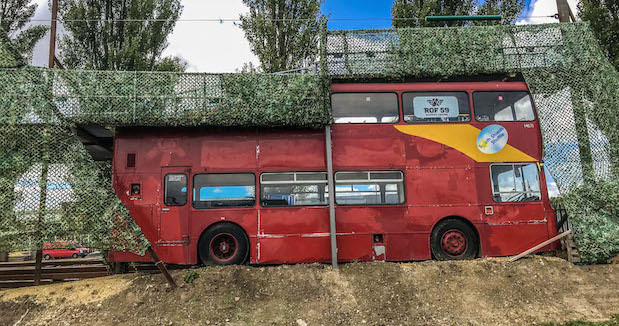 The attraction, located in Newton Aycliffe, allows those brave enough to leap from a 19m platform before racing through the sky at 35mph and coming to a stop on an old double-decker bus. It opened this month at the ROF 59 activity centre, which wanted to create “something completely different” for visitors, according to founder John Finley. John explained: “We’ve had the land for a lot of years, and I had the idea when we first launched ROF 59 nearly three years ago. Leisure industry manufacturer Entre-Prises, based in Lancashire, was tasked with installing the zip line. It is one of a number of attractions introduced at the 70,000 sq ft centre over the last 12 months. Earlier this year, ROF 59 created a new drop-zone where participants can throw themselves off a 19m platform and land safely thanks to a harness and freefall auto belay. The company also invested £350k last year to expand and re-launch its climbing area. ROF 59 was established in 2015 with a £1.1m investment that transformed the old Presswork Metals building and former Second World War munitions factory into an entertainment and leisure venue. Speaking further, founder John said: “We’re always trying to come up with new and exciting ideas different from anything in the area and we think this is a genuine first for the North East.